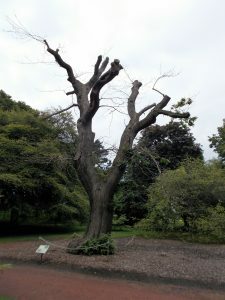 Regular visitors to the garden will have noticed a mature Sweet Chestnut in the later stages of its life with only a slim strip of living tissue running up the east side of its trunk. When trees get old they have less energy available to carry out vital processes such as growth, the production of seeds and defence against pests and diseases. To compensate for this they allocate resources to key areas and section off less productive parts. They begin to shed branches and eventually loose their structural integrity. This is a natural process in the aging of a tree. By removing branches before they fail and shortening the main stems we have improved the stability of this tree. This allows the tree to be retained for conservation purposes. Dead and dying trees provide vital functions within ecosystems. In fact dead trees are often more diverse habitats than living trees supporting a greater amount of biodiversity. As part of the work carried out a number of conservation features have been incorporated in and around the tree that mimic what would occur naturally as a tree ages with the aim of improving biodiversity. When wood dies it looses some of its defensive properties making it easier for colonisation by deadwood organisms including fungus, bacteria and wood boring insects. These organisms break down the wood both as a food source and also to create a habitat to live in. As the structure of the wood is altered through decomposition it allows for a succession of specialist organisms including spiders, millipedes, mites, bats and birds to further colonise it. In the later stages of wood decomposition, known as the humification phase, the remaining wood is converted into humus, releasing the last of its nutrients back into the soil where they can be utilised again by plants for their growth and development. This cyclical system allows ecosystems to sustain themselves over long periods of time and is a vital process for the preservation of life on earth. Around 30% of the overall woody biomass of a healthy forest can be made up of dead wood and it is calculated that over 2000 species of UK invertebrates require the process of wood decay in order to carry out their life cycles. Further to this 13% of all native species of plants and animals are specifically dependant on deadwood as a habitat. 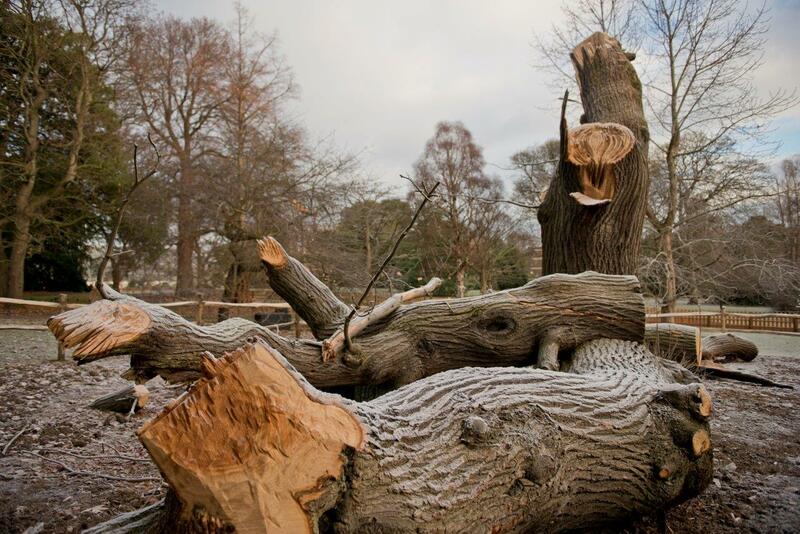 Yet it is often removed from sites to be used for firewood, on safety grounds or to keep areas tidy. This has resulted in a serious decline in the organisms reliant on dead wood to complete their life cycle. Consequently deadwood is now recognised as a vital component of woodland ecosystems and its preservation has become a key conservation issue. Deadwood has deliberately been retained as standing deadwood and, dead branches left at the base of the tree. This provides a favourable and varied habitats for the organisms dependant on it. As the wood goes through its stages decay it will provide different micro-habitats at different times and support a succession of different organisms. 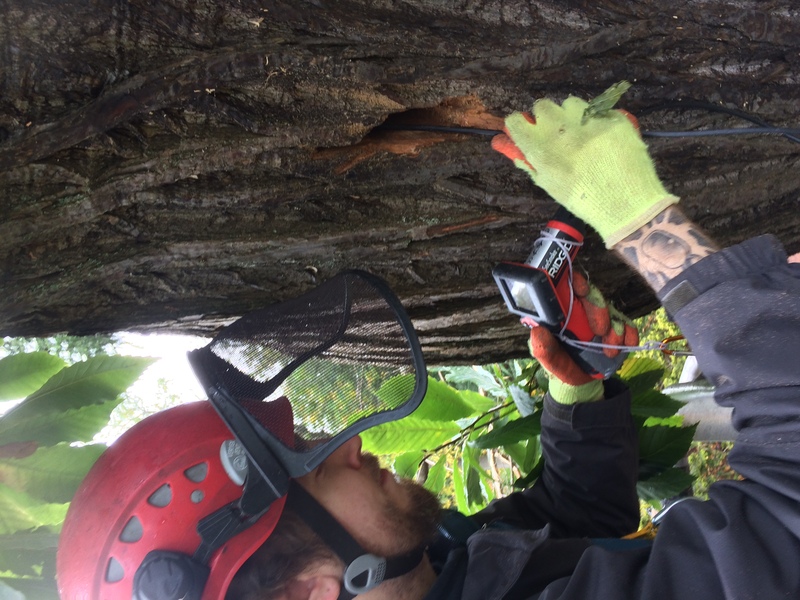 A survey in the summer of 2017 showed that Pipisterell bats were using a cavity in a dead limb near the top of the tree as a roost. The limb needed to be removed on safety grounds due to its position above a main path in the garden. In the UK bats are a protected species and conservation legislation is in place to maintain their populations. 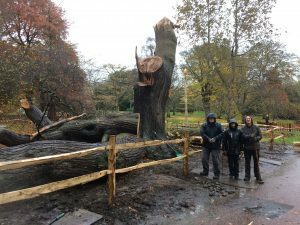 To do this RBGE applied for a licence from Scottish Natural Heritage and worked with consultants from Echoes Ecology to put in place measures to protect the bats. Inspecting the new artificial roost. A fortnight before the branch was removed one-way bat excluders were installed at the entrance to the roost. These allowed bats to leave the roost but not then return to it. 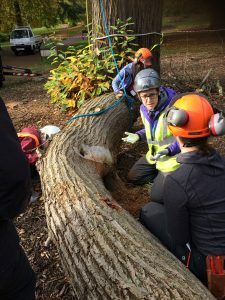 Further down the stem in a section that was to be retained artificial roosts were created using a chainsaw allowing bats to continue using the tree as a habitat. 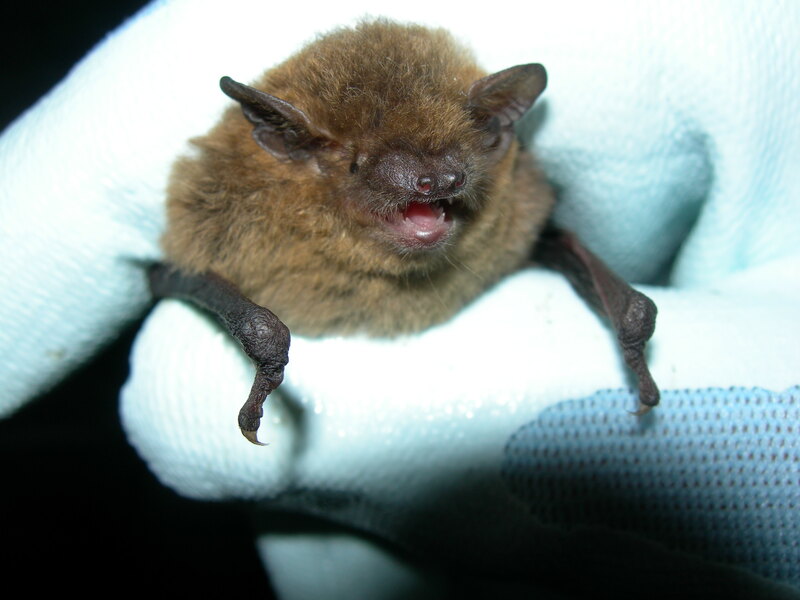 Roost size varies depending on the species of bat using it. It was therefore important to carve a narrow cavity that sloped upwards to meet the requirements of Pipistrellus spp. On the day the branch was removed the original roost was inspected to ensure that bats were no longer in situ. 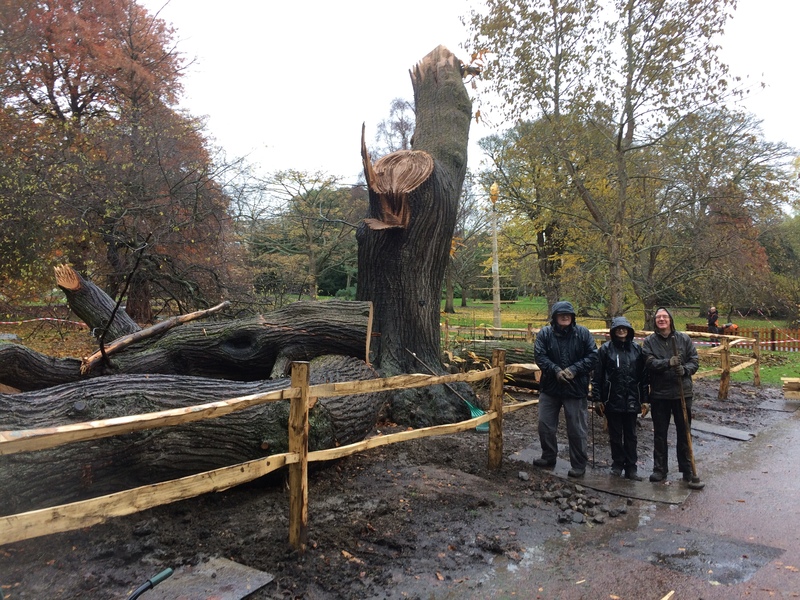 The branch was then cut from the tree and lowered to the ground in a controlled manner using ropes and pulleys. Once on the ground it was re-inspected to ensure that the bats had left. Natural fracture pruning mimics the tearing of wood along the grain with jagged edges as often occurs due to storm damage. This technique will increase the surface area of the wound, expose more heartwood and create cavities. 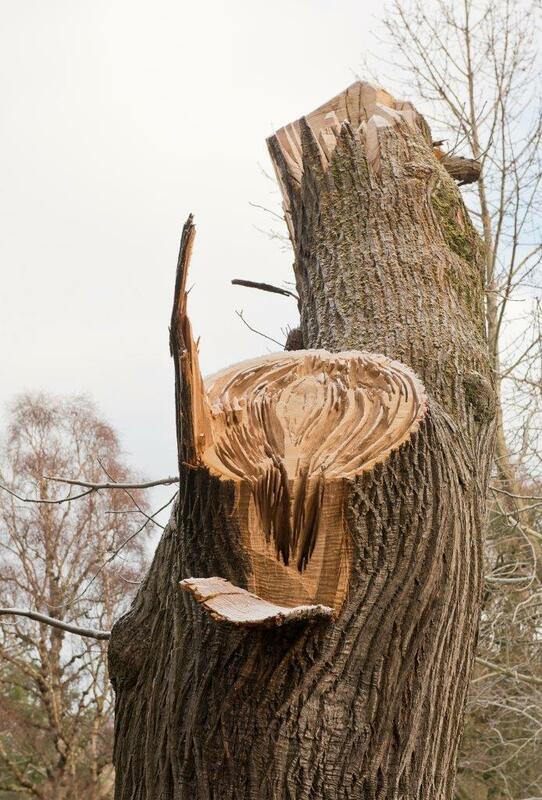 It can also accelerate the decay process in the wood allowing more bacteria and fungi to colonise it, in turn improving the biodiversity within the tree. 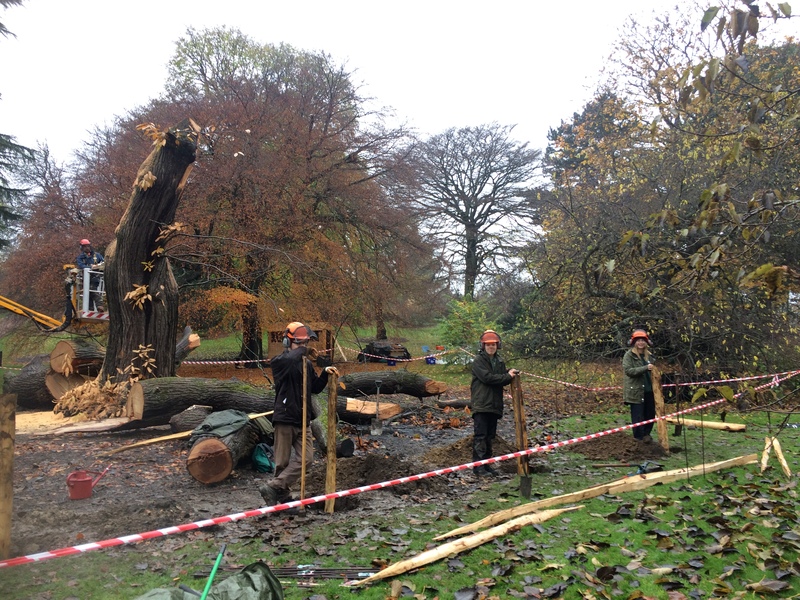 Cleft post and rail Sweet Chestnut fencing has been installed by staff, students and volunteers to limit access around the base of the tree. This defines the area as a wilder sanctuary within the more formal garden landscape. 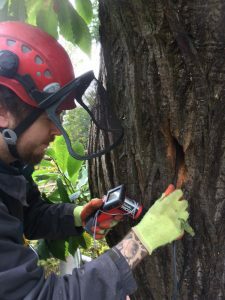 Sweet Chestnut fencing is resistant to decay for longer than many other types of timber meaning it does not need to be treated with preservative chemicals. The fencing material used here has been sustainably grown by ToryHill Chestnut Fencing on a 20 year coppice cycle in an ancient, semi-natural woodland near Maidstone in Kent. Wood coppicing is a tradition that goes back over 5000 years in Britain. When the stems grow to the desired height and diameter they are cut at the base of the tree known as the stool. Once cut the stool is stimulated and new growth begins from the base. The resulting new growth can be harvested periodically without killing the roots allowing for continued harvests into the future. The stock that this fencing came from has been coppiced for over 500 years. Coppicing has become an important management practice for conserving a wide range of organisms that are reliant on the habitats that it provides. The area around the tree is going to be planted over the following months. Plants will be selected to improve biodiversity and will include species that are a good source of nectar as a food source to support the organisms living in the tree. As the deadwood continues to decay its nutrients will be released back into the soil to be utilised by these new plants continuing the cycle of life and death that our ecosystems so crucially rely on. Nicolas Porter, William Hinchliffe, Peter Wilson and, Keith Glass.